Spryfield’s new farmers’ market brings the community together in the name of healthy eating and fresh, local food. A jam-packed first day at the Spryfield & District market. "We had 2,000 people, I think," says Marian Munro, the Spryfield & District Community Market's volunteer market manager. "Although I might be missing four, more or less," she adds, laughing. A sheet of scratched-up looseleaf paper sits on top of Munro's stack of notes, line after line of tiny tally marks covering both sides, a repetition of lines stacked top to bottom, side to side. She scratched them off as people came in the door of the new market. In the first 20 minutes it was open—before 8am on Sunday morning—she says 150 people came through the door to shop from the 37 vendors on the floor. Plans for the Spryfield Market started small in September, with just over a dozen vendors originally planned for the J.A. Walker Golden Age Social Centre. 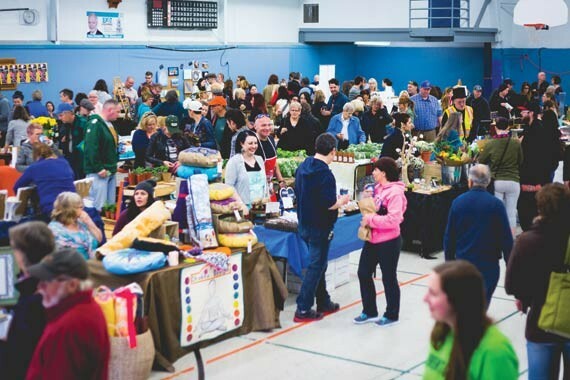 As the story of the market unfolded, the vendor list tripled and the market landed at the Spryfield Lions Rink Recreation Centre, a wheelchair-accessible space with enough room—capacity 900—to create a warm, convivial space where people could both shop and gather. "Everything about this market has been a story," Munro says. She has been working with a steering committee of volunteers since the fall to bring the market to life. "We knew we couldn't do it ourselves: if we wanted community buy-in, we had to bring the community to the table. We hashed it out and we did the forming, storming, norming, re-forming—we went through all of it." The market plans to be a not-for-profit society run by a seven-person board of directors. The society's objectives are, primarily, to bring locally grown food to Spryfield. But they also want to help educate about healthy eating and topics that are germane to markets and healthy food, and to offer a place for the community to gather. Munro herself was also drawn to the entrepreneurial aspect of the market. "I like to create start-ups and I wanted to create an opportunity for people like myself: I'm near retirement, restarting my soap business and wanted a place to start up again," she says. "I wanted to surround myself with young farmers, and young and old people who are looking to start new business. And an inexpensive way to start is the market." As a 14-year-old in Truro, Munro was given a youth grant and started Mother Hubbard's Cupboard, a small business that sold tie-dyed t-shirts, candles and soap. Later, she worked in farming for a decade, obtained a degree in agriculture and had a son. "Then I divorced and thought 'OK, I need to do something else, farming's not going to cut it for me.' I was more interested in people than farmers," she says. "So I went back to school and studied botany." Along with her volunteer position at the market, Munro is the curator of botany at the Nova Scotia Museum of Natural History. "I'm near retirement now," she says. "I need something else. Government services have served me very well—it's been a wonderful career—but I'm looking into moving back into something more creative." And so she has returned to soap with Archana Sabana, a small-batch, botanical soap business. She used to sell at the Alderney Market—"up until last week, basically," she says—and since she knew a lot of farmers and vendors, she found it very easy to find people who could add a Sunday market day to their weekend schedule. 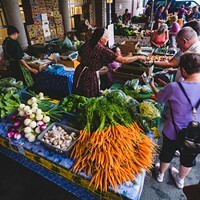 With fresh and frozen seafood from Sambro Fisheries; beef, pork and eggs from Brigewater's RR Corkum Farm and Canning's Wild Mountain Farm; and organic vegetables, mushrooms and herbs from Tap Root Farms, Komatiq Farm and Odds and Herbs respectively, the market has a solid foundation with farm vendors. You'll also find honeys and jams, prepared cakes and cookies, Indian food, tea and several delightful crafters. Some of the vendors were skeptical, Munro admits, doing the market based out of friendship more than anything. But the success of the first day has them excited. "The farmers that came from Queens County were originally like 'Jesus, Marian, do you know I have to get up that morning at three to get to your market?' along with a few other choice words, but I asked today how they were feeling and if they'd come back, and they said 'I wouldn't miss it,'" she says. "And I heard that from every farmer and every food vendor. Nobody said 'I'm not coming back.' I'm thrilled."